Get ready to ride with the GCPD in these epics from DETECTIVE COMICS #41-47 and the Sneak Peek story! 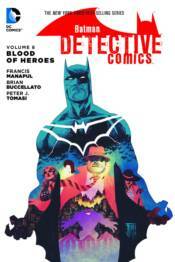 With a new Batman on patrol, Harvey Bullock is leading a Bat task force-but can he be trusted? And what kind of welcome awaits his new partner, Renee Montoya? Plus, the Joker's Daughter reveals her plans to take on Batman and his task force-and they might prove deadly to Jim Gordon! And the new Batman goes on his first mission with the Justice League to solve a series of mysterious mass murders.